Today is the start of the week-long Institute of Genealogy and Historical Research (IGHR). It’s the last year that IGHR will be at Samford University in Birmingham, Alabama; next year the Institute moves to the University of Georgia at Athens under the auspices of the Georgia Genealogical Society. So… The Legal Genealogist is on the road today and will be jammed all week, teaching, learning, rejoicing in the first of this summer’s institutes that we love to call summer camp for genealogists. But that doesn’t mean the blog will be silent. Nope, we’ll use the time and the space to go over some terms we all need to understand and use as genealogists. 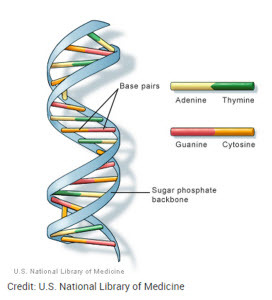 Today’s term, for DNA Sunday, is DNA. Now you’d think that we’d all know what DNA is by now, right? I mean, we’re using it as a tool every day in genealogical research. But do we really understand what those letters stand for, what they mean? The DNA code, or genetic code as it is called, is passed through the sperm and egg to the offspring. A single sperm cell contains about three billion bases consisting of A, T, G and C that follow each other in a well defined sequence along the strand of DNA. Each egg cell also contains three billion bases arranged in a well-defined sequence very similar, but not identical to the sperm. It’s almost like chemical one’s and zero’s being passed along to the shift register (cell). When the register is full, an interrupt flag is issued and this coded information is passed off to that mass of neurons called the Central Processing Unit. All this achieved without the benefit of Microsoft or Intel. MS and intel aside, not really. Trying to explain what happens with DNA by invoking the simplistic model of electronic computers simply doesn’t work. There is not analog, not even an approximate one. The complex interactions are only beginning to be grasped. Judy’s explanation is a good place to start, but it’s good to remember: this really was the very beginning of research into the workings of our genomes. And all it is, is a description of structure. Now let’s tackle nuclear DNA vs mitochondrial DNA…. .